Arely Pavón-Torres is a living testament to the transformative nature that economic empowerment has for women in Latin America. 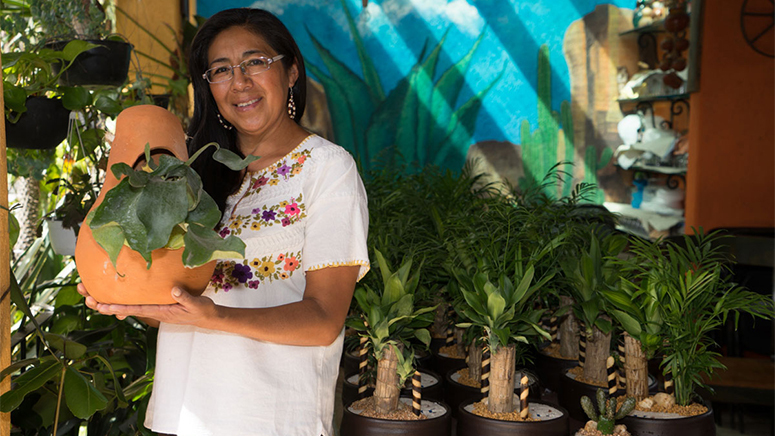 Arely has a green thumb that she has turned into a plant business from her home workshop in Xochimilco, Mexico. As a client of Pro Mujer – a nonprofit women’s development organization that works with women in Latin America – she had access to financial services and business and empowerment training that gave her the finances and confidence she needed to make her potted plant business successful. Arely Pavón-Torres has a green thumb that she has turned into a successful plant business from her home workshop in Xochimilco, Mexico. “I used to be one of those women with downcast eyes,” Arely confessed. But economic empowerment gave Arely the ability and strength to leave an abusive relationship and better care for her two daughters. Today, her business reaches clients as large as Costco and she has been able to build a beautiful home and provide a good education for her children. Her success has been recognized internationally, and she was awarded Pro Mujer’s Entrepreneur of the Year award at a 2015 gala. She also shares her story with her daughters and other women entrepreneurs to inspire them to empower themselves. Praxis Mutual Funds® supports small-business owners like Arely through investments in Calvert Foundation, an impact investing institution that helps people around the world through community development financing. Pro Mujer is one of the organizations that Calvert Foundation supports. For more stories about people who benefitted from these investments, visit the Praxis Community Development Investments page at praxismutualfunds.com. View the original story from the Calvert Foundation website here. Calvert Foundation enables people to invest for social good. Through its flagship Community Investment Note, more than 15,000 investors have channeled more than $1 billion in investments to hundreds of nonprofits and social enterprises worldwide. Investor dollars empower women, fund the construction of affordable housing, provide loans to small businesses owners, increase access to health care, and support fair trade and sustainable agriculture. To learn more, visit calvertfoundation.org. Foreside Financial Services, Inc. is not affiliated with Calvert Foundation. Calvert Social Investment Foundation, a 501(c)(3) nonprofit, offers the Community Investment Note, which is subject to certain risks, is not a mutual fund, is not FDIC or SIPC insured, and should not be confused with any Calvert Investments-sponsored investment product. This is neither an offer to sell nor a solicitation of an offer to buy these securities; the offering is made only by the prospectus, which should be read before investing.